as ya'll know, i always tend to have a pack of thawing chicken in the sink. i am continuously thinking of creative ways to cook chicken. 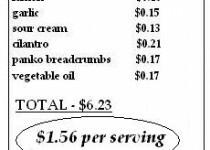 it's one of the most inexpensive meats and our freezer is full of them. anyway, i had this lonely little avocado that was very ripe. once the thought hit me to stuff the chicken, i thought, oh, let me add bacon! i went down to the freezer and all i had was a pack of turkey bacon. i have to admit, i was a tad disappointed. it's not that i do not like turkey bacon, i just wanted real bacon in this particular dish! but i had an idea. i browned the turkey bacon well, until it was extra crunchy. once i folded it into the avocado cream sauce and tasted it, i could not tell it was turkey bacon. the recipe was a success. it was one of the best chicken recipes i have ever made. heat a medium sized pan over medium high heat. once hot, add one tablespoon of the vegetable oil and turkey bacon. toss the bacon as it cooks, until it is brown and crispy. using a slotted spoon, remove the bacon to paper towels. set aside. cut the avocado around the seed and open up. remove the seed and scoop out the avocado into a small ziploc bag. add the lemon juice, garlic, sour cream and salt/pepper to taste to the bag as well. squeeze the avocado and other ingredients through the bag until well blended and smooth. squeeze the mixture out into a small bowl. fold in the cilantro and reserved bacon. taste, adjust seasonings and set aside. season the chicken breasts well on both sides with salt/pepper to taste and lay the breasts flat on a plastic cutting board or surface. add 1/4 of the mixture to the middle of the chicken. 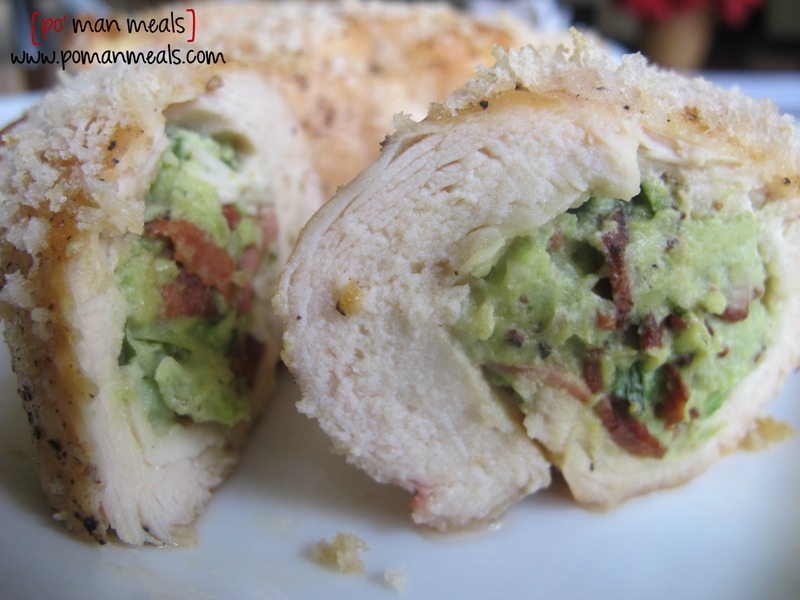 fold the chicken around the avocado mixture creating a roll. secure with 2 toothpicks. repeat with remaining chicken breasts. preheat a cast iron skillet over medium high heat. add the remaining vegetable oil (2 tablespoons) once the skillet is hot. carefully place the chicken rolls into the skillet. allow to sear on that side for about 3-4 minutes until lightly browned. turn the chicken over (so the browned side is up), sprinkle the tops of the chicken with panko breadcrumbs and place in the preheated oven. cook for about 25- 30 minutes or until the chicken is cooked through. remove toothpicks. serve hot!